The Richland Fire Department is a paid on call volunteer department comprised of 45 members including seven line officers and the chief. The department’s proper legal name is the Richland Fire Department, but it is also known as the Richland Center Fire Department (RCFD). Our department protects the City of Richland Center, WI, one incorporated village, and all or parts of twelve of Richland Counties sixteen townships. 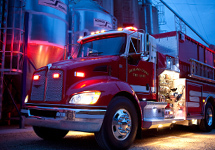 The area protected by the RCFD comprises of 310 square miles, with all of our fire equipment being housed in a single station in the city of Richland Center, WI, the county seat for Richland County. We travel to the county line in two different directions from our station. This makes our department one of the largest first response service areas in the entire state protected by a fire department either volunteer or full time in the state of Wisconsin. Within our response area are fifteen educational facilities, thirteen government buildings, a four story hospital-clinic complex, and a University of Wisconsin two year campus. Also located in our response area are twelve buildings containing 370 plus apartment units occupied primarily by elderly and disabled residents. We also protect around 615 miles of city, township, county, state, and federal highways, along with the Richland Center Municipal Airport at Sextonville. Our response area has a population of approximately 11,500 people, with just over 5000 of these in the City of Richland Center. Prior to 2004 our department structure was a city run department, with some equipment along with our station being owned by the city, and a rural district made up of the townships owning some equipment and renting storage space for it in the cities station. There were two operating budgets, one for each department, and the department manpower served both departments. 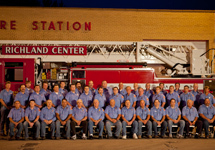 In January of 2004 after many years of negotiations the City of Richland Center Fire Department and the Richland Rural Fire Board combined all of their resources to form the Richland Fire Department. The departments governing board consists of members of the city council and rural township boards. This joint board of directors meets the second Monday of each month at 8:00 pm at the fire station. The RCFD responds to an average of 120 calls per year. We provide and receive mutual aid to seven neighboring fire departments. The RCFD went through the Insurance Services Office (ISO) rating in the fall of 2008 and in the spring of 2009 received the good news that our city rating had improved to a Class 3. We are currently working on the needed items to improve our rating for the rural areas that we cover. Our department is dispatched by the Richland County 911 Communication Center located in the county courthouse. Our apparatus fleet consists of two engines (pumpers), and an engine/tender with a total pump capacity of 3750 gallons per minute, a 100’ aerial platform for rescue and elevated water supply with a 2000 gallon per minute pump. Two rescue trucks split duties by call type. One is dedicated to carrying the department’s Jaws of Life equipment for rescue from auto and other accidents, to also include Haz-Mat responses, the other is for transport of firefighters and equipment to fire type calls. This unit also has an incident command area, and both units have 18,000 watts of scene lighting for night time operations. Both units have mobile breathing air refilling systems for filling firefighter’s air packs at fire scenes. We have three tankers with a total combined capacity of 6800 gallons of water for initial response to calls out side of the cities fire hydrant covered area. This increases to 7600 gallons counting the water carried by the engine. There is also a utility pickup truck with portable pumps to refill these tankers from ponds or rivers that may be located close to the fire scene. We have two four wheel drive grass trucks and an Polaris 6×6 ATV for off road use at grass or wild land fires. The Polaris is also outfitted for patient transport during off road rescue operations. We also utilize a light rescue vehicle for additional firefighter transport. The mainstay of the department apparatus is “Old Number 1”, a 1941 Ford open cab pumper. This unit was refurbished in 1998 which included new paint, new gold leaf decals and new wooden ladders. The unit is currently used for parades and special functions. The Richland Center Fire Department also has a hand drawn hose cart that hangs on display in the rear of the station. The department is proud to own five thermal imaging cameras to assist in looking for victims in buildings, look for hot spots in a smoke filled environment, or aid in firefighter rescue if needed. We host an open house at our station each summer for the public to come in and see their fire department’s equipment and meet the members of the department. In October of each year during National Fire Prevention Week, we host an appreciation dance for the members of the public to show our thanks for their support of the department over the last year. In the fall of each year we visit local schools to talk with students on fire safety. The firefighters bring the safety house trailer to these presentations to assist with our education program. We have two fire inspectors in our department that inspect commercial buildings as required for safety and code violations. The department membership has training meetings twice monthly on the 1st and 3rd Mondays. It is on these meeting nights that members of the department are assigned “Duty Crew” duty. 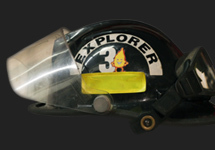 The department firefighters are assigned to one of three crews “A, B or C crew” with an equal number of members on each. Two line officers are assigned to each duty crew, these assignments rotate from meeting to meeting. A duty crew is paged for responses that may not require a full department response, this includes vehicle crashes. 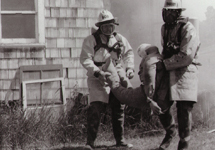 Firefighters serve either two or three week rotations on their crew, from meeting to meeting. Officers have additional meetings on the 2nd and 4th Mondays. The Explorer group is active in the department. They are younger members of our community that are interested in the fire service. Many members of the department have been in this program, with some successfully pursuing fire or other emergency services fields after leaving our local area. Three became full time paramedics, one is a Lieutenant for a full time fire department, one is in charge of an emergency department at a hospital, and one is an instructor at an emergency service training academy. It is the goal of the RCFD and our Board of Directors to provide the best possible fire protection and rescue services to the citizens in our response area, as well as anyone traveling through it, 24 hours per day 7 days per week. Please spend some time getting to know your Fire Department better. We hope that you enjoy you visit and find the information on this site to be helpful. Further information about the department can be obtained by clicking contact us.